In War of the Worlds, a gritty, contemporary retelling of the 1950s George Pal film, adapted from the novel by H.G. Wells, director Steven Spielberg reunites with longtime collaborators at Industrial Light & Magic and actor/producer Tom Cruise to put a modern spin on the classic alien invasion story, told from a more intimate point of view. 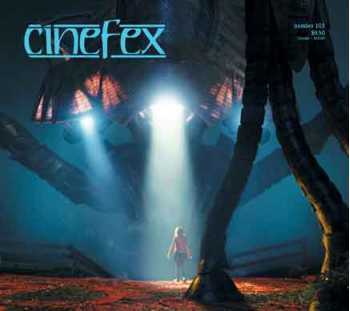 Working at breakneck speed to accommodate a compressed shooting and post-production schedule, ILM crews, under senior visual effects supervisor Dennis Muren and visual effects supervisor Pablo Helman, took advantage of upgraded digital tools and a revamped pipeline to produce the fearsome army of extraterrestrial tripod war machines intent on destroying the world. Following an eight-year hiatus, D.C. Comics' masked crusader returns to the big screen in Batman Begins, directed by Christopher Nolan. For the newest installment, which traces the traumatic events of Wayne's childhood and his early adulthood as a means of exploring the psychological underpinnings of a superhero, Nolan rooted the film in a real-world sensibility that serves as a counterpoint to its comic book origins. Dan Glass and Janek Sirrs headed up the visual effects work, which included elaborate miniatures by Cutting Edge and Steve Begg, and digital effects by Double Negative, The Moving Picture Company and Buf Compagnie. Chris Corbould supervised the film's extensive physical effects, including a radically remodeled Batmobile. Director Rob Cohen once again demonstrates his penchant for visceral displays of speed in Stealth, a cautionary tale of technology run amuck in a not-too-distant-future where computer-controlled drone fighter jets are used in combat. For thrilling aerial scenes involving the drone and a fleet of futuristic stealth bombers, Cohen turned to a Digital Domain crew headed by visual effects supervisor Joel Hynek, tasked with creating digital planes and environments, as well as a host of miniature effects for the film. Physical effects supervisor John Frazier led the practical work, which included construction of an elaborate hydraulic gimbal enabling Cohen to shoot his actors in dynamically moving cockpits.